This power-packed, peppermint scrub soap sloughs away dreary dry skin while massaging nubs help stimulate circulation and de-tangle tight muscles. Perfect for an invigorating morning wake-up call! Our currently most-wanted big bar is this mint-oil-rich serious scrubbing soap. Loved by guys and girls alike, it transforms the bland bath from drab to fab! Work up a lather, breathe in the invigorating scent and rinse. 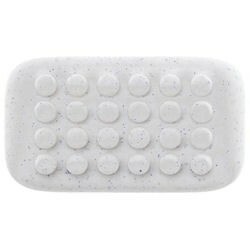 Use the massaging nubs of mammoth minty soap to stimulate circulation and relieve tired muscles. This power-packed, peppermint scrub soap sloughs away dreary dry skin and has massaging nubs that help stimulate circulation and de-tangle tight muscles. • It has 3% natural mint oil and exfoliating jojoba beads so it simultaneously smooths, stimulates and circulates. Sodium palmate, sodium palm kernelate, water (aqua), glycerin, fragrance (parfum), sodium chloride, menthol, simmondsia chinensis (jojoba) seed wax, pentasodium pentetate, tetrasodium etidronate, citral, tetrasodium EDTA, limonene, titanium dioxide (CI 77891), ultramarines (CI 77007). gycerin: soothing humectant which draws moisture to the skin to help retain and enhance hydration. natural mint oil: imparts an invigorating, cooling sensation on the skin stimulates to enhance surface circulation. jojoba oil beads: emollient and moisturiser that heps prevent transepidermal water loss to maintain suppleness and hydration, while gently exfoliaiting for smoother skin. Gorgeous refreshing invigorating peppermint scent and oils. Massaging bumps and jojoba beads for great exfoliation. Lathers well and leaves skin feeling fresh and cooled. I really love this soap but why oh why did they make it so big!! Apart from it being difficult to hold it is very fine milled and lasts for a long time without turning mushy in the bath. The peppermint oil is so refreshing and it is perfect after the gym or in the summer months! I love the exfoliating jojoba beads which along with the peppermint makes your skin tingle with freshness. It lathers well and does not dry out the skin. This is an excellent, multi-tasking pick me up product and my husband loves it too! !